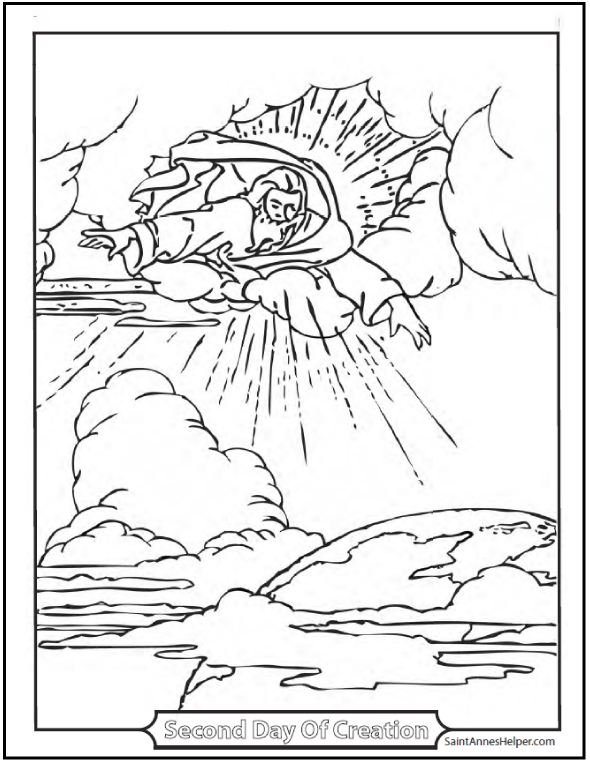 This Creation coloring page shows a picture where God made a firmament and divided the waters. Genesis 1:7 This PDF prints 8.5x11" single sided. 2nd Day of Creation: Show the children the places to color the water and the land; and the differences in the clouds and the sky. 1:6	And God said: Let there be a firmament made amidst the waters: and let it divide the waters from the waters. 1:7	And God made a firmament, and divided the waters that were under the firmament, from those that were above the firmament, and it was so. 1:8	And God called the firmament, Heaven; and the evening and morning were the second day. Commentary: 1:6	A firmament. . . By this name is here understood the whole space between the earth, and the highest stars. The lower part of which divideth the waters that are upon the earth, from those that are above in the clouds.